Every once in a while, a game comes along that becomes a blockbuster. It could be any kind of game, any genre or type. Their only common denominator is that they somehow catch the greater audience's interest and manages to hold it long after newer games are released, so people can look back at it, and think of the times when you played it for the first time with fondness. It could be the brand new kind of graphics, a new experimental idea that turned out to be incredibly successful, or maybe just the atmosphere of the game. Whatever it is, it was something that managed to hold gamers up til 4 at night, even though you had to work or go to school the day after. One such game is Baldur's Gate, which many refer to as a "rebirth" for role-playing-games, as the genre was stagnant for a long time in the 90's, until this came along. There were other games too, yes, such as Diablo, but even if they might have been fun, they were nothing more than action-games with some RPG-elements. 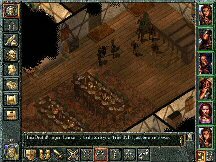 When Baldur's Gate was released in 1998, though, it was just what was needed for the genre to make a huge leap, and suddenly we were surrounded by RPG's, of varying quality, many of them clones of each other. It would be very interesting to to look at the game that started this revival, though, and that is exactly what will happen. Prepare to enter the Forgotten Realms, the Sword Coast, and ultimately also the city in which all the events in the game come to a climax, Baldur's Gate. The installation process of the game goes smooth, where you can choose what things of the game you wish to install. I always chose the maximum option, though (1,5 GB), since I did not want to have to change CD's between the areas in the game. Entering the game, you are presented with an intriguing and ominous intro-scene, giving you the impression that something dark is looming by the horizon, and whatever it is, you will surely be involved in it, in some way (wouldn't be much of a game otherwise, would it?). Before starting the game, you can create your own character, or use one of the pre-configured ones - although I doubt anyone uses those. You can choose between a number of classes, his/her weapon proficiencies and distribute their attribute points in whatever way you feel like, creating a unique character. You can also choose more physical properties, such as your character's face and his/her soundset, and also import your own of these, although I never did. You start in the secluded Candlekeep, where you have lived all your years, and are on the brink of man/womanhood. Here, you have lived and studied as you have grown by your foster father Gorion. This is all told in the "narrator"-sequence (more about those later). When the game starts, you get to know that your foster father has sent word to meet you. You can, however, take some time to familiarize yourself with the game first, by talking to the different sages around you, who will provide help on some topics about for example the interface. Except for this, there are also some errands to run, where you can learn how to keep track of quests in your journal, and how to gain experience points. Last, you can also practice the combat system in a number of places. This is done in a good way, so it feels as if it is a normal thing to do, instead of having it forced upon you. The familiarizing part of the game is very non-intruding and you can always skip whatever you don't feel like doing. It is not something you have to go through every time you play the game, such as the case was with for example Black and White. After you after a lot of petty tasks and deflecting an attempt on your life you finally meet up with Gorion, and you leave Candlekeep together. To make a long story short, he is murdered in an ambush by a huge imposing figure, who was only intent on having your life. For what reason, you don't know. You wake up the day after the ambush, which you managed to escape, and this is where the game begins. The first thing that happens is that you meet a friend of yours (who you also met earlier in Candlekeep), and she becomes your trusty companion throughout the whole ordeal. Later, you will pick up more NPC's, and some are even story-related, although others are not. These NPC's doesn't feel much like the normal braindead soulless characters we usually see, and even if they are not of the quality of Planescape: Torment or the game's own sequel, they still feel as if they are not simply a soundset, a portrait, and a character class packed together. They have a few conversations of their own, and will reflect on your reputation in the game (how "good" or "evil" you behave). The world in which the game is played is a part of the Forgotten Realms, namely the Sword Coast. The game consists of probably over a hundred game areas, ranging from forests to stinking slums in cities. These surroundings are not rendered, but painted, and it makes it very nice to look at. Sometimes, this in combination with the occasional thunderstorm makes you put your headphones on and turn the volume up real loud so you can just sit and enjoy the atmosphere, wondering where the nearest cave might be for you to take shelter in. Talking about such things, the sound effects are very well done, especially the ambient and background ones. You can hear birds chirping and rickets playing at night when in a forest, and the busy sounds of city and street life when you are in a city. In caves, there is always the faint sound of dripping, and the muffled sounds of wings, probably from small bats, but maybe you. You can never be sure what awaits you in the darkness ahead. It is in this world you experience the game, and it is a very long journey. There are many quests to undertake, and some are found at a total random in the wilderness, and other ones are of significance to the story itself, but there are many, many sub-and non-related quests as well. Unfortunately, many of these are merely errand-quests, without anything exciting that way, but the exploration which you will experience as part of it makes up for it. It does become tedious, however, when you have to run through endless woods, only to deliver something to another person. Kind of like the Bloodmoon-expansion to Elder Scrolls III: Morrowind, in the forest there. The game is played with a party (or solo) of up to 6 people, each with their own characteristics and attributes. You can change everyone's armor, spells and even the AI-script, so no longer is it just your character who is the "most important" one, where the other's only help you, but you actually control the entire group as much as you control your own PC. There is a big problem with this party-oriented gameplay though, and it is small spaces. People will get stuck, the pathfinding is kind of bad to be honest (even though a patch was released to fix it), and you will get frustrated many, many times when battling in small spaces. It is a good thing, then, that not much of the game takes place in cramped areas. The interface takes some time to learn, but once learned, it is very logical. Magic spells is handled well by either using quick-spell slots or a special spell-button where you then choose between your available ones. The most useful feature, and what was very new at the time, is the ability to pause the entire game so you get a chance to think things through and give your orders then, before letting it resume, and everyone do what you told them to when the game was paused. The inventory system is well enough handled, but it gets a bit messy at times, as there is no way to divide it into different sections or such, but feels as if it all lies in one big heap. One thing about the inventory system is that if you enter it during battle, the game can not be paused, and you can not change armor. Some have complained about this, but personally I liked it, since it made you think things through and prepare before rushing into battle. The sound is, as already mentioned, of very good quality. Besides the background sounds, the sound effects of fighting are pretty good. People grunt or scream when they are hit by something and they cry battlecries before and during battle. The magic effects feels just right, with the typical chanting before, and then the release, with the burning effects of a fireball or sizzling of lightning following. The voices in the game are also top-notch, and especially the narrator (who also plays the mail villain). This narrator is the one who between chapters and sometimes in chapters during a sequence tells you about the story, as if reading it from a book written in first person, present time. He adds a lot to the atmosphere, with his slightly hoarse, very intriguing voice acting. The music is, however, the strongest part of the audio in the game. It is composed by Michael Hoenig, a German composer, and in the same style as majestic films, like Lord of the Rings. Ranging from the medieval-style market music in small cities and villages to the oppressing and snow tunes when trudging through forests or mountains, it is really a work of art. I would also give him an award for managing to create the music with most atmosphere in, namely the "Fort" one. You who have played the game and been at the Gnoll Stronghold, among other places, know which one I'm talking about. It's almost so thick that you can touch it. As for the graphics, they are dated, yes, but they still serve their purpose, and does nothing to decrease the fun-factor of the game. It may not be as detailed as newer games, or with the same kind of effects, but it is smooth, and combined with the beautiful backgrounds and weather effects, it has the ability to still capture the player. As for bugs, I did not notice many. The infinity-engine has a peculiar ability to mess up quests and other things by suddenly removing people, making them unable to talk to and the likes that deals with characters and their connections to quest. It is very instable, but I can not think of a single one that occurred while I was playing BG. I did experience a crash-bug, but it was a few times in a matter of months, so it does not count for much. The stable gameplay and a very intriguing story combined with good graphical atmospheric features and involving sounds make for an unforgettable experience.